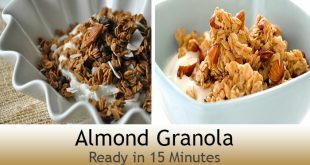 Create for yourselves a high fiber homemade cereal. It will save you from the difficult ingredients set on the back of maximum cereal boxes. Mix wheat germ, oats and wheat bran in a big bowl. Take a medium bowl mix brown sugar, 蜜糖, 水, and vegetable oil. Add in cinnamon, nutmeg, vanilla extract, salt and mixt it. Blend the brown sugar mixture into the oat mixture till evenly moist and transfer to a large baking dish. In the preheated oven bake it for 45 分钟, stir it after every 15 minutes until it change into light brown. Add pecans, dates and coconut into the dish and continue bake for 15 分钟. Store in airtight containers after it get cool.